Petroleum industry makes use of many different activities in all the sectors of the business cycle: from upstream to downstream. Oil and services company’s management apply HSE policies to all levels of operations and in all sectors. Health, Safety, Environment are separate issues, each with its own technology, but they are often combined in the same functional groups within the oil companies. These three subjects are of paramount importance to the petroleum industry and adherence to HSE guidelines is a requirement for operators worldwide and is also dictated by internal policies of most corporations. It is fundamental to have and implement an HSEMS (Health, Safety and Environmental Management System) which defines the principles by which operations are conducted and control the risks in the whole industry cycle. The health function typically deals with the well-being of the employees as they live and work in their environment. It deals with the conduct of activities in such a way as to avoid harm to the health of employees and others, and to promote, as appropriate, their health. Typically, the health function focuses on the effects of oil field chemicals and oil field physical environment on employees. The safety function focuses on protecting the employee from risk involved during any type of operation and duties. It is related to the principle that all injuries should be prevented and actively promote amongst all those associated with their activities the high standards of safety consciousness and discipline that this principle demands. The safety function seeks to minimize these risks and monitor the effectiveness of the minimization activities. The environmental function focuses on the effects that petroleum activities have on the natural resources. The environmental issue pursuit the progressive reductions of emissions, effluents and discharges of waste materials that are known to have a negative impact on the environment, with the ultimate aim of eliminating them. It aims to provide products and services and advice which will not cause injury or undue effects on the environment. It promote protection of environments which may be affected by the development of petroleum activities and seek continuous improvement in efficiency of use of natural resources and energy. The declaration of environmental compatibility is then issued on the basis of a synthetic evaluation which is the cornerstone for conclusions on how acceptable the environmental risk is in terms of chemical pollution, noise pollution, visual impact, smells and, more generally, of any other element which may interfere with the environment. Oil Companies are constantly researching technology which will allow them to reconcile their operations with the protection of the environment and local ecosystems. 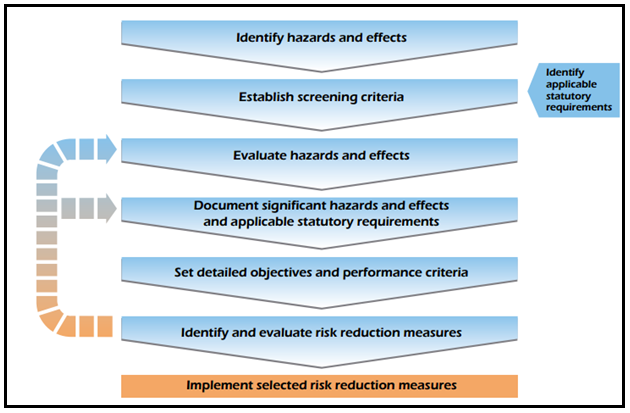 Occupational health and safety issues should be considered as part of a comprehensive hazard or risk assessment, including, for example, a hazard identification study [HAZID], hazard and operability study [HAZOP], or other risk assessment studies. The results should be used for health and safety management planning, in the design of the facility and safe working systems, and in the preparation and communication of safe working procedures. During the transport of petroleum, safety and environmental issues are well studied, assessed and continuously implemented to avoid any type of problem which could affect the people involved and the environment which can be very sensitive (land and marine). The marine transport of oil has increased during the years and the spills are not an occasional consequence of oil traffic. The main causes of shipping accidents that cause oil spills are sinking, collisions, mistaken manoeuvres at the loading and unloading terminals, running aground, fires and other accidents on board. Direct impacts are generated by processing units and by the activities carried out within the refinery. The industry’s adoption of more stringent restrictions concerning environmental safety does not always mean increased costs in the long-run, but can also provide an opportunity for improving the overall efficiency of a productive activity as well as create conditions of greater competitiveness.